A little while ago I dedicated a review article to man’s best friend. Today I have another brilliant collection of dog stories that highlight their boundless vivacity, loyalty and dedication, not to mention their occasional misdemeanours, that truly make our pets so loveable. 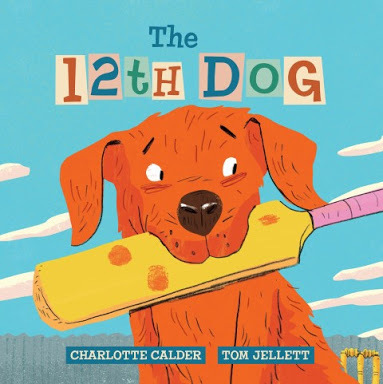 The 12th Dog, Charlotte Calder (author), Tom Jellett (illus. ), Lothian Children’s Books, Jan 2017. To adoring cricket fans, and of course dog lovers: this one’s for you! Oh, and you have the added bonus of the eye-popping, crowd-pleasing illustrations by the legendary Tom Jellett! Combining his three favourite c’s; chewing, chasing and catching, Arlo the dog loves to play cricket. Except he never gives the ball back. Struggling to play for the team, Arlo is sentenced to the pavilion (the kennel) by the children as the 12th dog. But he makes a come-back to form. Skilfully integrating cricket terminology into an everyday, Aussie backyard scene sees Arlo score the winning run and he is crowned the best fielder in the street… but is he? Brilliantly characteristic of ball-loving dog behaviour in an exciting pitch of teamwork and sportsmanship, The 12th Dog marvellously bowls out humour, cricket knowledge and a beaut Aussie flavour. Any fan from age four will be cheering for more. Howzat!? 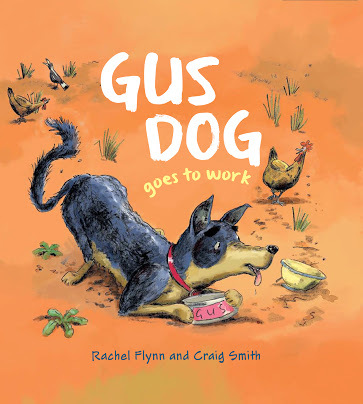 Gus Dog goes to work, Rachel Flynn (author), Craig Smith (illus. ), Working Title Press, Jan 2017. This book both melted my heart and had me laughing out loud. What a gorgeous representation of a loyal working dog, with a big personality. The narrative and the illustrations both reflect these aspects beautifully. Gus Dog goes to work is uncannily relatable and articulately universal, even if the setting is in rural Australia. Tom the farmer belongs to Gus Dog, and together, they have the perfect formula for a good working relationship – A mixture of special, ‘formulated’ breakfast with the commonality of an understood language. One day Gus awakes to the disappearance of Tom, and so off he sets on his explorative journey to find him. Using his natural doggy instincts, Gus sniffs and looks and listens and chases and rounds up and rolls in everything he comes across, only the townsfolk are highly unimpressed with his antics. He doesn’t understand everything, but drawing on some of his human-word-knowledge, he knows what ‘getoutovit’ means. Gus also recognises ‘goodboy’ and ‘gohome’, which are music to his ears when he’s finally reunited with Tom. With fluid pencil work combined with digital painting, Craig Smith has sensationally captured the energy, wit and idiosyncrasies of this working dog and the special bond with his owner. The narrative has elements of a mocking humour matched with a visceral innocence, which superbly depicts the dog’s point of view. Loyalty, friendship and communication between man and dog faultlessly combine in this funny and loveable story. Gus Dog goes to work will be received with pleasure, compassion and relatability by its preschool readers. Blue the Builder’s Dog, Jen Storer (author), Andrew Joyner (illus. ), Penguin Random House, Aug 2016. 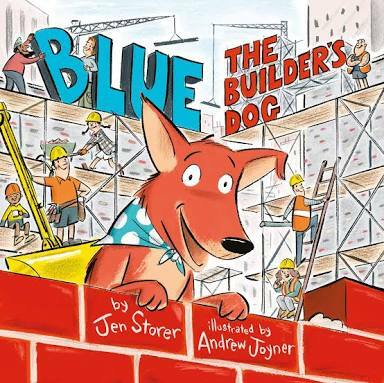 In another tale of a working dog with a mind of his own, Blue the Builder’s Dog is delectably sweet and fiercely passionate in all matters on the building site. Jen Storer brings her quirky and charming sense of humour to this reflective and encouraging story, as does the awesome Andrew Joyner with his lively, retro-feel illustrations, representative of independence and being strong-willed. Blue is dedicated to his job. He guards the tools, signs the concrete slabs, inspects the works (often) and keeps stickybeak cats away. He is friends with everyone on the team. Except Blue wants more. He wants to be able to go up high, wear a hard hat, and most of all, a home of his own. Living in the shed is no place for a Working Dog. So, with great building plans in mind, Blue quits his job and embarks on his own grand endeavour. His creation is nothing short of remarkable (for a dog), but it seems this kennel is short of stability, particularly in a big storm. Realising his shortcomings, Blue makes amends with his builder and the team. And there is another new and improved design too. 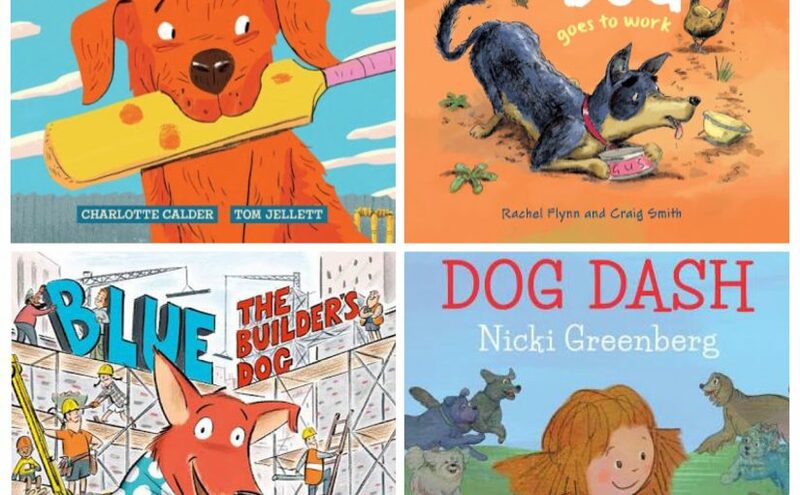 Blue the Builder’s Dog is an animated story of teamwork and having a voice. It shows a determined character who makes a clear statement about the importance of marking one’s territory, so to speak! Humorous with cleverly portrayed themes and insights that children from age four will adore. My Dog Dash, Nicky Greenberg (author, illus. ), Allen & Unwin, Apr 2016. If you haven’t read this story then I’m not going to spoil it for you. But let’s just say that this dog has no problem coming out of his shell. On first read, I found this so surprising I had to do a double-take! The title, My Dog Dash, may be ‘misleading’, but demonstrates perfectly how easily something, or someone may be misjudged by preconceived notions. 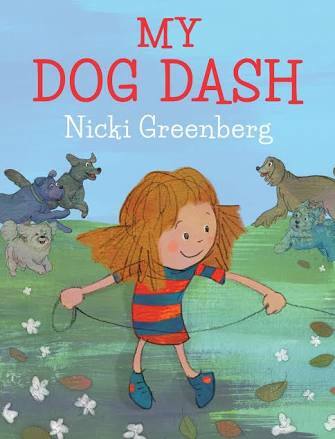 Despite Dash’s inattentive meanderings, misreading of social cues and favouring for homely disorder, the girl narrator is passionate about the wellbeing of her beloved pet, even when others don’t understand. She is dedicated to training him, walking him and cleaning up after him. When Dash disappears one night, the girl is naturally devastated (however not to any dismay by her parents, by the looks on their faces). In a most satisfying ending, there is one more shocking surprise. You’ll have to read it to find out! I love the rawness of this story; from the sacrifice of standing up for a misunderstood friend, to the natural, earthy tones and mixture of pencil sketching and textured paints in Greenberg’s illustrations. My Dog Dash is a quirky, comical take on what is considered ‘normal’ puppy behaviour. Friendship and responsibility are at the heart of this sweet tale for preschool children. Remember, don’t judge a pet by its covering!